Eric bopped Grandpa in the nose. Lola disappeared for a week and returned home pregnant. Steve swings from the curtains like Tarzan. And Penny growled at the pizza delivery guy. Rude roommates? Dysfunctional family members? Characters on a new reality show? 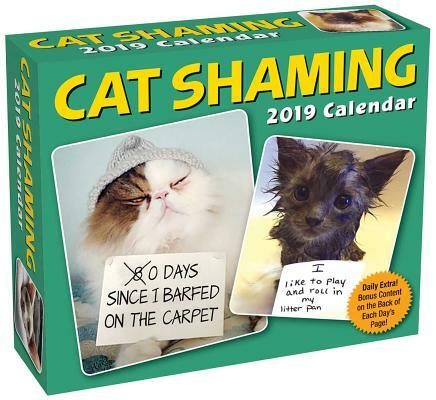 Nah, they're just a few of the cats and their misdeeds featured in the Cat Shaming 2019 Day-to-Day Calendar. Same goes for Millie, who catches little birdies and releases them under the bed; Luna, who likes to watch people shower; and aptly named Brat, who refuses to eat kibble that has been in the dish for more than fifteen minutes. Featuring hilarious contributed photos from the popular Tumblr blog, the Cat Shaming calendar provides plenty of commiseration and comic relief for cat lovers everywhere. As an added bonus, the back of each page includes Daily Extra content such as puzzles, jokes, lists, quotes, tips, and trivia. Pedro Andrade was inspired by Dog Shaming, as well as his own two mischievous cats, to start a Tumblr blog in 2010. The blog reached half a million followers in 2016. Pedro lives in California.